When a garage door breaks down, it's always inconvenient. Homeowners rely on their door to work smoothly and reliably day in and day out, so when something goes wrong it’s usually essential to make sure everything gets fixed as quickly as possible. 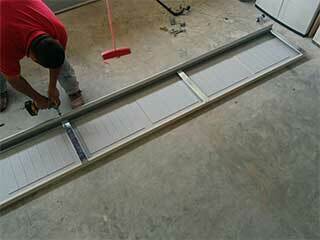 Our experts provide a wide range of repair services for garage doors of all makes and models. Garage doors are complex machines, and while they’re built to last they will eventually start to wear down the more they get used. When parts begin to fail, it can be difficult to identify exactly where the root cause of the problem lies. That’s why our engineers are trained to quickly assess the underlying issue that led to the door’s failure. Whether it has something to do with track or sensor misalignment, a broken spring, or a burnt electrical wire in the opener, we'll identify and address the cause of the problem, and then proceed with the necessary repairs or replacement of the damaged component. As all the parts of a working door are interconnected, the failure of one component can impact many other ones. When a door has suffered a malfunction, it’s essential that the entire system is given a once over to ensure that no subtle damage has been missed. This ensures that the door is restored to full working order, and that it won’t develop any further issues as a result of this particular breakdown. We understand how crucial a prompt response can be when dealing with a variety of garage door issues. Since some the system's components can be incredibly dangerous, it's important that any problem gets solved quickly. That's why we offer emergency repair services – we'll help you out as soon as we possibly can. If your door has suffered a malfunction, no matter what the problem may be, you will require the help of a professional garage door repair technician. As soon as you run into problems, contact our experts at Garage Door Repair Evanston. We’re always happy to help.